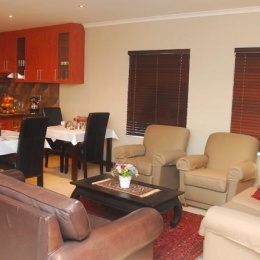 The guest house is situated in Rosendal, a residential suburb near Bellville in Cape Town. Mountainview Guesthouse offers three double rooms with magnificent views on the Boland mountains. 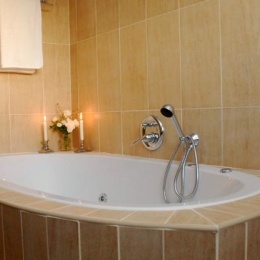 All rooms have en suite bathrooms. There is a fully equipped kitchen and lounge. All rooms have DSTV and there is a swimming pool and barbeque area for guests to enjoy. Squash- and tennis courts are only 200 m away and the Old Oak Bowling Club is around the corner. There is a fully equipped kitchen and a lounge which opens up onto the balcony, from where you can enjoy the view on the Boland mountains. Safe parking is just outside the front door and there is a safe place for kids to play. We are 25 minutes from the centre of Cape Town and the V+A Waterfront. The Cape Winelands, Table Mountain and many beaches are a mere 30 minutes drive away from us. We are also close to the Tygervalley Centre, which caters for all the needs of the traveller or business person.